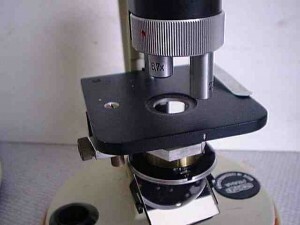 Not really my favourite microscope, but definitely a favourite. I have a large (46×34×19 cm) camera case which I have fitted out to take a modified Russian Biolam, a Nikon trinocular head, a cut-down Beck stereo, lighting unit, slides, dishes, compressoria etc., etc. With it I can do (almost) anything I can do at home with my large Russian research stand. But it weighs a ton. What I needed was something really light, so when many years ago this Meopta portable came on the market I snapped one up. I can’t remember exactly how much it was – about £50 I think. I was sceptical at first; the objectives weren’t real objectives, with an RMS thread, and everyone knows – don’t they? 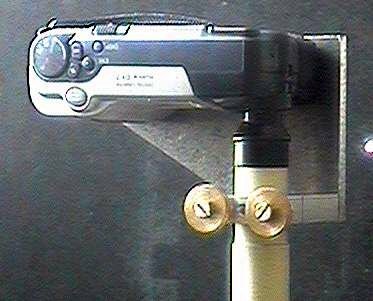 – that all the books say that if you do buy a microscope make sure it’s a proper microscope which can take proper (RMS thread) objectives. This is advice with which I profoundly disagree, but more of that later. Well, it’s light – just over 1 kg (2.2 lbs), and it’s fairly small – the 15 cm (6 inch) ruler in front shows the scale. Off comes the top – it’s a microscope! Now it’s assembled you can see the main features. The focussing knob actually moves the stage. The movement is a simple friction device, but it is quite smooth. The original stand just had a convex mirror, but I felt the objectives deserved something better, so I fitted a front surface mirror and a home-made condenser, which has proved very worthwhile. 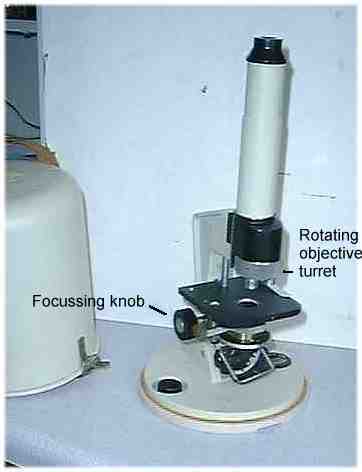 Here’s a close-up of the objective turret: the three objectives are ×3.3, ×6.7 and ×20. I have not measured the NA, but the image quality is fully comparable with most standard objectives of those magnifications. I use wide-field Meopta ×10 or ×15 eyepieces. So there you have it. 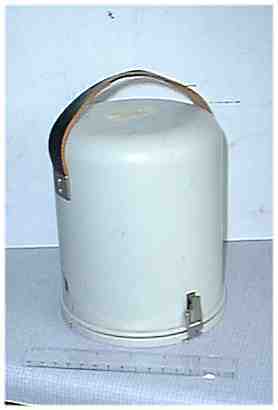 A thoroughly practical instrument that you can take anywhere with minimum effort. Later I shall try to publish some pictures taken with it to show the image quality. 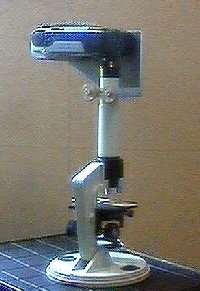 After this article was published, Stijn Coccoris of the Dutch Microscopical Society supplied some information that he had obtained from F. Herza, who worked for the manufacturer Lambda Praha Ltd.
Production of the AZ-2 microscope started in 1970 and finished in 1991–92. 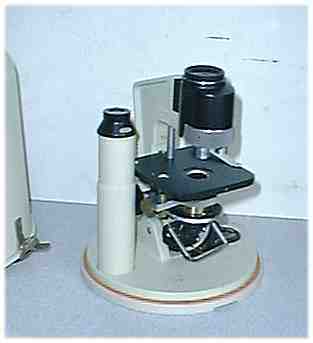 Here are two photographs of a bracket for attaching a small digital camera to the Meopta microscope.